One common struggle among writers is finding the best place to start a story. How do you fit your character, needed backstory, setting, and plot all in the first few pages? I’m a big fan of starting with action like Marissa Meyer does in Cinder. That way you can setup your story while hooking your reader. 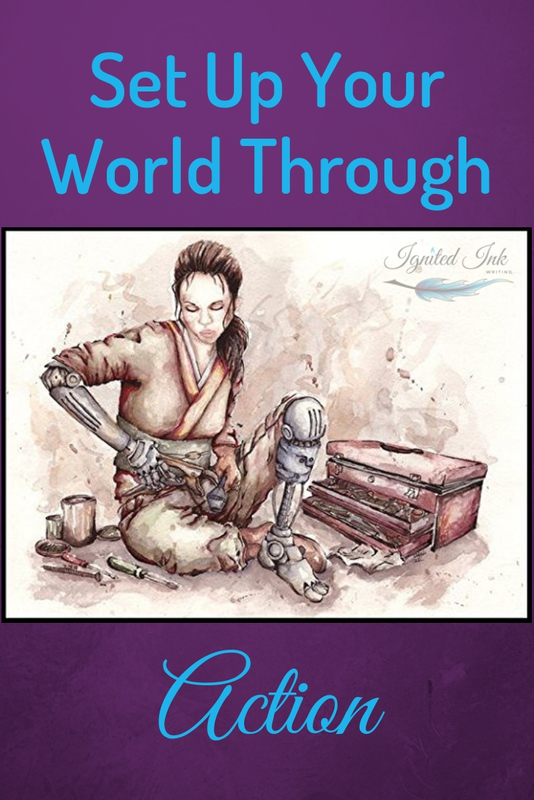 The screw through Cinder’s ankle had rusted, the engraved marks worn to a mangled circle. Her knuckles ached from forcing the screwdriver into the joint as she struggled to loosen the screw one gritting twist at time (1). The first two sentences of Cinder reveal the main character, that the character is a cyborg, and that the current screw has been in use for a long time. All of this is shown through the action of the character working to remove her too-small foot. Beginning with action in this way allows your reader to get to know your world by your character’s interactions with it. Instead of saying “Cinder was a cyborg,” Meyer shows Cinder’s bodily state and her determination to upgrade herself. When you show your characters interacting with your world instead of only describing the world or the character, you accomplish more with fewer words. You describe the important parts of your world – the parts impacting your characters – and how your characters feel about and fit into their world all at once. Layering your story in this way makes it more interesting, keeps the pace up, and gets to the inciting incident faster. Cinder was the only full-service mechanic at New Beijing’s weekly market. Without a sign, her booth hinted at her trade only by the shelves of stock android parts that crowded the walls. It was squeezed into a shady cove between a used netscreen dealer and a silk merchant . . . (1-2). The first line is exposition: Meyer is telling the reader what Cinder does for work and where. The second line transitions from exposition to a description of Cinder’s booth. This is a great example of how to use exposition in the beginning of your story. Meyer didn’t go into a whole spiel about how Cinder came to be a mechanic or run that booth. Instead, she used a single line to share what the reader needed to know to understand the present scene. When you’re working on the beginning of your story, focus on the present scene. What is happening right now, in this moment? What does the reader need to know to understand only what is happening right now? That’s what you should reveal. Everything else can wait until later. When you try to shove too much world building and backstory into the first pages of your story, you kill your pace and eliminate the action. Action, like Cinder removing her screw, means something is happening. An event is taking place. That is what hooks your reader. 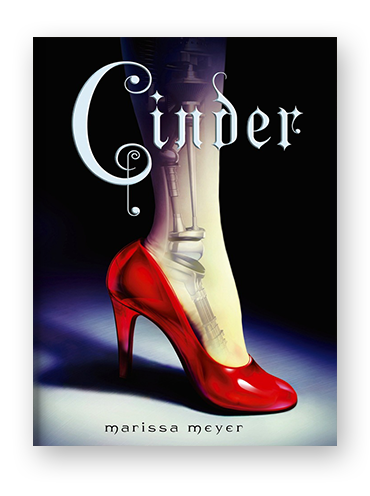 Readers of Cinder want to know why the main character is removing a screw from her foot, so they keep reading. Then they want to see if her friend arrives with the new foot, so they read more. 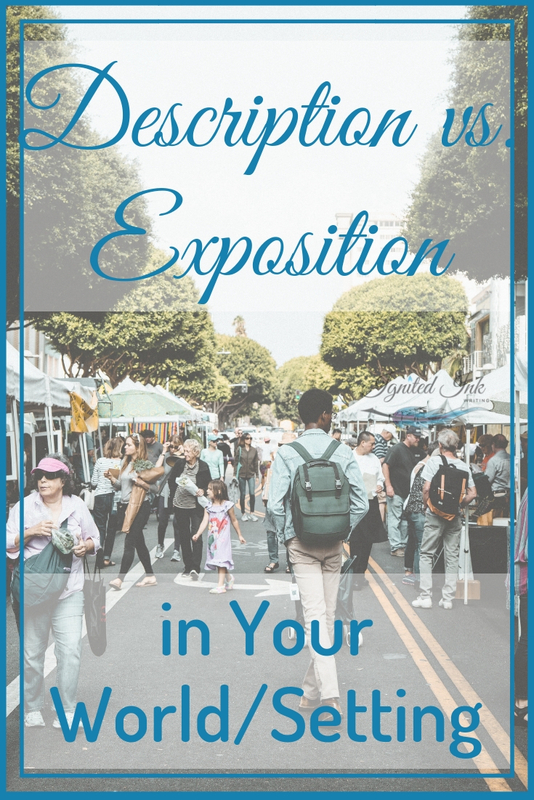 Once your reader has become curious, you can slip passages of description and lines of exposition into the scene to provide the context they need to understand your story. In the blog post Exposition, Description, and Dialogue: How to Find the Balance, I talked about when to use each of these techniques and how they shouldn’t be equal portions of your story. Cinder strikes this balance well. While the first few pages are mostly description with a bit of exposition, the rest of chapter one has a substantial amount of dialogue. Flipping through the pages of the novel shows the whole book has a good balance of dialogue and description/exposition. During revision, scroll or flip through your story. Just by glancing at the pages, you should get a rough idea of your dialogue to description/exposition ratio. Make sure you have plenty of both. If you only have 10% dialogue, ask yourself why you aren’t having your characters interact more. If you only have 10% exposition/description, ask yourself what you need to describe to immerse your reader in your story. Then during one of your read throughs, mark your exposition passages. Make sure you are using summary where it’s needed, not where you should be showing your reader the details of the scene. Even though the main character of Cinder is a cyborg, she is still very much a teenage girl. The combination of teenager and monster is a common trope or theme in young adult literature. Just think of all the vampire and werewolf books. However, there is a reason teenagers gravitate toward these stories. Teenagers’ bodies are going through many changes. Some are painful. Some are gross. Some are embarrassing. It feels like they are turning into a monster. Novels like Cinder show characters who could easily become literal monsters fighting to master their bodies’ changes and succeeding (for the most part). These characters are then able to use their new bodies and abilities to accomplish their goals. Cinder doesn’t necessarily want to be a cyborg, but she deals with it. Just like most girls don’t want to have periods and most teenagers don’t want different body hair everywhere. Cinder learns to master her body and discovers new abilities over the course of the novel and series. 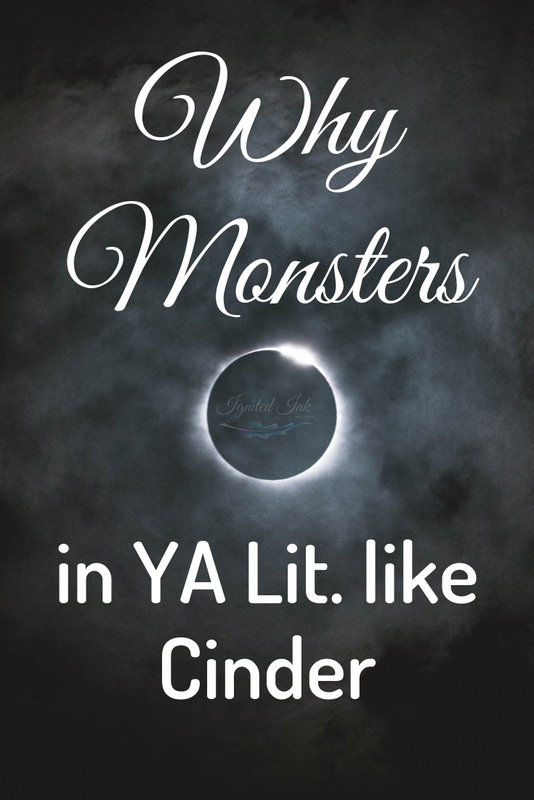 Think about this if you’re writing a YA monster story. How can you use the changes in your teenage monsters to relate to the changes modern teenagers face. Every time I passed Cinder in a store, I was drawn to it. The cover and title made me so curious, I finally gave in a purchased it. I love twists on fairy tales and haven’t seen Cinderella in a futuristic, science fiction world before. I was immediately sucked into the world and the character’s story. That’s what I want for my readers. If you can’t seem to find the best place to begin your book, read the first chapter of Cinder. Pay attention to how Meyer begins with action and builds her world and characters. Notice when she stays in scene and when she focuses on the larger setting or character backstory. Then list a handful of scenes you could use to show your character interacting with your world and that lead to your inciting incident. Find a balance between description, exposition, and dialogue that makes your reader’s curious, keeps your pace going, and Ignites Your Ink. What other techniques does Meyer use to hook her readers in Cinder? Share your thoughts in the comments below. For more articles on how to read like a writer and start your story, subscribe to Ignited Ink Writing.